A Sunday school teacher of preschoolers asked the students to learned one fact about Jesus by the following Sunday. The following week she asked each child in turn what he or she had learned. Susie said, "He was born in a manger." Bobby said, "He threw the money changers out of the temple." 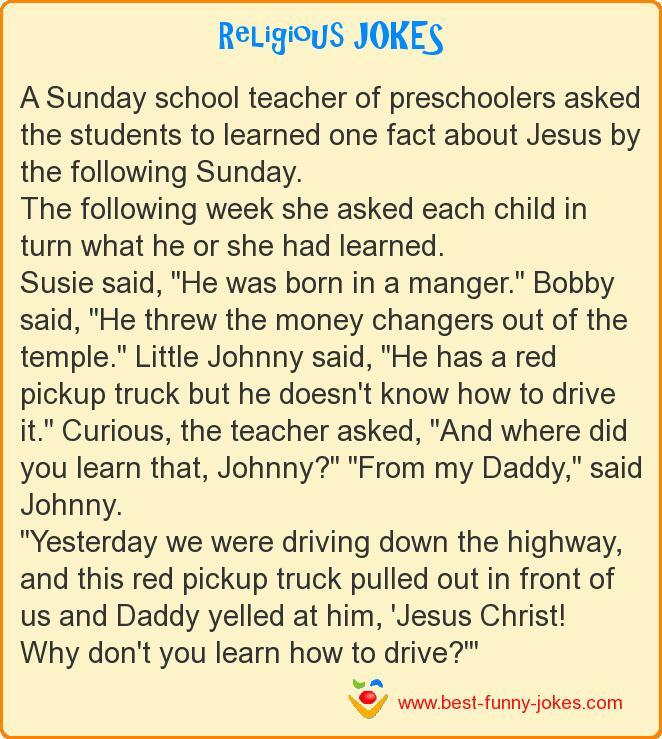 Little Johnny said, "He has a red pickup truck but he doesn't know how to drive it." Curious, the teacher asked, "And where did you learn that, Johnny?" "From my Daddy," said Johnny. "Yesterday we were driving down the highway, and this red pickup truck pulled out in front of us and Daddy yelled at him, 'Jesus Christ! Why don't you learn how to drive?'"